Three more on the bone pile waiting to be squished. This follows (3) G.P. 's, (3) Malibus, (2) Monte Carlos, (2) El Caminos and (1) Cutlass in the past six months at this smaller yard. Several members on here have benefited from parts off one of these cars...but, I just can't anticipate all that people will need in order to save more parts as funds & storage are limited. 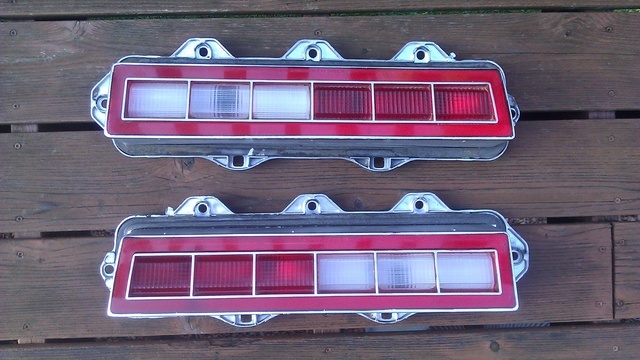 BTW...I pulled the '77 tail lights to save them as they looked nice...but, left them at their office on temporary hold for me as I had no idea if there would be any interest in them. Photo shows the white lenses to be cloudy...but, they are not. Probably looking at around $40-$45/ea. (plus shipping). Let me know if interested. You would think they could hire someone to take apart cars prior to crushing them and sell the parts or hire a contractor to remove and purchase the parts from them. I would think if someone had an old warehouse or something to store parts with a good inventory tracking system and time they could sell parts pretty reasonably. I don't know how much they can get for scrap but its possible they could be losing out money by not allowing themselves to add another revenue stream. Some do. We work with several yards in this area that participate in a nationwide network via an app that lists all their car parts online for them to sell, so they can get maximum revenue out of a vehicle before crushing the remains. Unfortunately, there's a hell of lot more of them that don't. 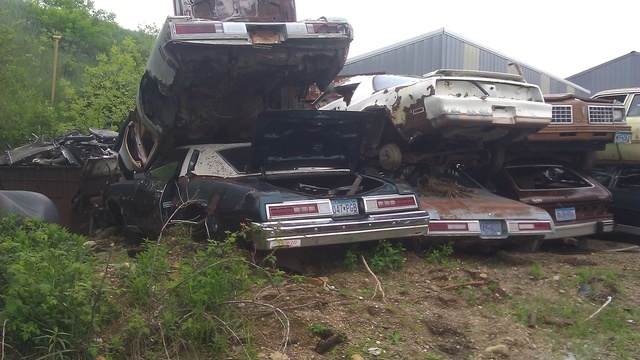 I was in a local yard with 5 mostly complete El Caminos. I was told to get what I needed because they were getting ready to crush them. Since I knew they only wanted the steel I ask how much he would charge me to go strip all the trim lens etc. Sitting there reclining in his office chair he told me he could not give me a price, I would just have to go pull what ever I wanted, bring the parts to the counter and then he would give me a price. I did go back a month later and all of them were gone. They don't care about all the little parts that we all need. Sad indeed. I work in a salvage yard that has of lately stopped taking in cars that are older than a 2000 or so. Most yards could give a rats rip about old cars of any sort. It's all about the scrap metal and not the parts. If anyone of us goes to a yard and see's parts that might be of interest to other's, it might be wise to grab them. I know, this is easier said than done, but sadly it's true. That's not Windy Hill's is it Steve? fasrnur wrote: If anyone of us goes to a yard and see's parts that might be of interest to other's, it might be wise to grab them. I know, this is easier said than done, but sadly it's true. This has been my credo for the past 10+ yrs or so...but, it's a gamble that requires a lot of time, out-of-pocket expenses and storage space while sometimes waiting for long periods of time for a Buyer in need...if you find one at all. I've literally helped hundreds of people all over the world over this time period...but, supply of good used parts continues to dwindle as more cars that have survived this long get crushed...with very few new arrivals to replenish them. So, keep this in mind before complaining about how expensive parts have become as, like in every other venue, supply and demand come into play. Just ask someone at DVAP or CTC Auto Ranch...lol! And no...this photo wasn't taken at Windy Hill. That yard is a shadow of what it once was as they crushed 90% of their old stock when the father sold it to the kids some 5 yrs ago or so. They thought the future was in later model parts....but, soon found that they lost most of their customer base. By then, it was too late to acquire much in the way of older replacement stock This photo was taken at the former Bridley Auto in Glenville (now owned by Misgen). They are gradually liquidating their cars and are currently down to (1) GP and (3) El Caminos remaining for G3 stock...and, there's not much left in the way of trim to pick on the Elkies. No matter how rusted a vintage car is, i always get a tear in the eye when i see them get crushed. Its like watching a murder take place. Even if its a rustet out hulk i feel sad, once it was someones new car that was polished and taken care of. Even more heartbraking it is to see Nice oldtimers just stacked on top of each other waiting for the final crush. I unfortunatly dont have the funds or time nor space to save them all. Had another very large yard here locally that had hundreds of cars from the 40's - 70's. One day I drove up there and everything was gone. From what I was told was the old owner had past away and his family could not quit fighting over everything, so the courts ordered all the cars be crushed and scraped, so the family could split the money. I use to buy from Jim when I was on the counter at Viking back in the early 90's. He always seemed to have what I needed. 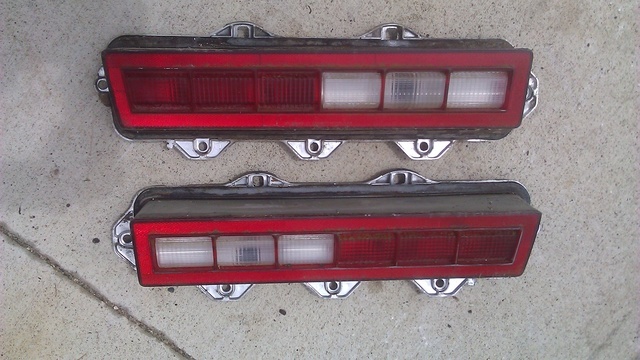 Yard Owner still had the tail lights on hold for me, so I decided to bring them back with me after my latest visit last weekend. Cleaned them up and detailed the lenses. They look nice! Offering them up for $110/shipped (Lower 48 states). They'd look good on the SE! Time is of the essence on these as they are basically on short-term consignment from the yard before I have to either pony up the money out of my own pocket or, bring them back.